Up at 5:45 a.m. this morning. I opened the front curtains and saw something brown down by the salt lick. At first I thought it was just a tree, but then I saw it licking. 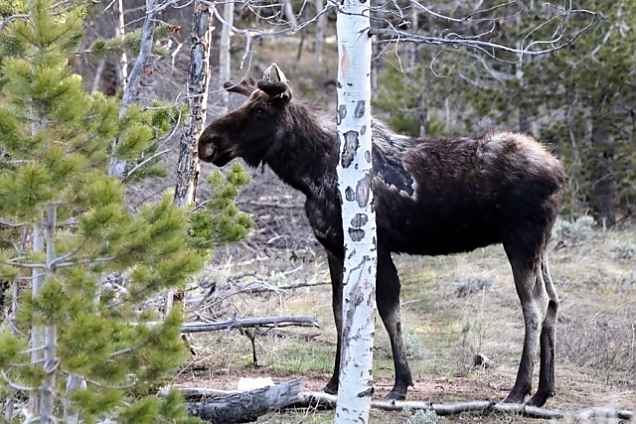 Finally – a moose! I tried a few shots through the screen on the front porch but they weren't good, so I snuck up on him outside, sticking close to the side of the cabin. He wasn't bothered by me at all. I think it might be the young moose we had last year since he's so raggedy. Maybe he has scabies? Or maybe it's an injury. He was in no hurry to leave and we had just fed the girls and they needed to have their morning pee. We waited. And we waited. Finally I knew Hailey was crossing her legs so we put them on leads and took them out the back of the cabin away from Mr. Moose. He's gone now, on to whatever moose do with their days. If he becomes a frequent visitor we might just have to name him.